37025 tnt 97301 1Q98 1437 Ely Recp. - Norwich - Ely Recp. 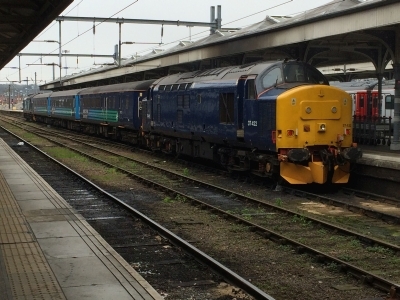 50007 & 50017 + 37905 + 41001 tnt 50050 5Z50 1210 Leicester L.I.P. - Dereham U.K.F. 37025 tnt 97301 1Z97 1928 Ferme Park Recp. - Ely Recp. 37059 + 37069 6C53 0630 Crewe Coal Sidings (Drs) - Sellafield B.N.F. 37219 3Z03 1020 Exeter Riverside N.Y. - Exeter Sig 679 - Exeter St Davids Sig. E35 - Exeter Riverside N.Y.
37423 + 37612 6C22 0656 Carlisle Kingmoor Sdg(Drs) - Sellafield B.N.F. 37025 tnt 97301 1Q96 1403 Ferme Park Recp. - Barking - Gas Factory Loop - Shoeburyness - Gas Factory Loop - Leigh-on-sea - Gas Factory Loop - Barking Upney Junction - South Acton - Camden Road - Streatham Hill - Ferme Park Recp. 37219 3Q55 2108 Exeter Riverside N.Y. - Penzance - Exeter Riverside N.Y.
37608 & 86213 + 86702 + 86701 + 86235 DIT 0Z86 1030 Leicester L.I.P. - Barrow Hill L.I.P. 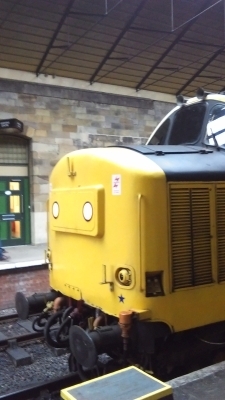 37025 tnt 97301 1Q90 1532 Derby R.T.C. 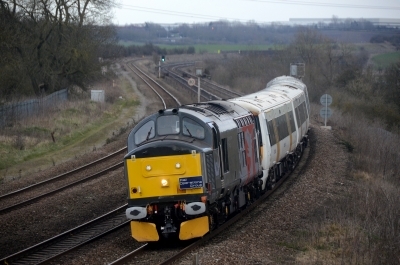 (Network Rail) - Audley End - Cambridge - London Liverpool Street - Ferme Park Recp. 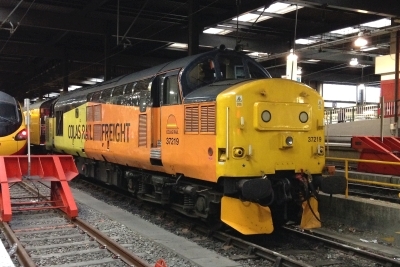 37884 0Z37 1028 Leicester L.I.P. - Barrow Hill L.I.P. 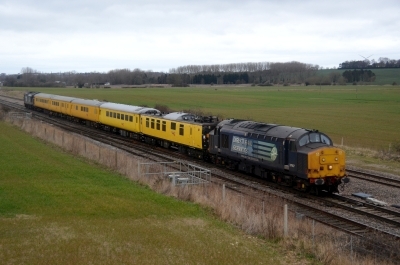 37884 & 37503 + 56104 DIT 6Z37 1457 Barrow Hill L.I.P. - Leicester L.I.P. 37607 tnt 37667 1Q67 1744 Woking Up Yard Recp. - London Blackfriars - Orpington - London Victoria - Orpington - London Waterloo - Paddock Wood - London Victoria - Hither Green P.A.D. 38057 3Q70 2057 Ferme Park Recp. - London Kings Cross - Hornsey - London Liverpool Street - Witham Down Loop - Clacton-on-sea - Colchester Goods Loop - Norwich T.C. 57312 + 37069 6C53 0630 Crewe Coal Sidings (Drs) - Sellafield B.N.F. 37057 3Q61 2212 Ferme Park Recp. - London Liverpool Street - Chingford - London Liverpool Street - Cambridge - Stansted Mountfitchet - Stansted Airport - London Liverpool Street - Ferme Park Recp. 37057 3Q60 1914 Derby R.T.C. (Network Rail) - London Liverpool Street - Cheshunt - London Liverpool Street - Southend Victoria - London Liverpool Street - Ferme Park Recp. 37607 tnt 37667 1Z03 1015 Derby R.T.C. (Network Rail) - Woking Up C.H.S. 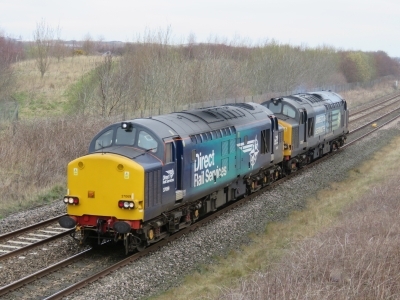 57306 + 37059 6C53 0630 Crewe Coal Sidings (Drs) - Sellafield B.N.F. 68019 + 37605 0M49 1849 Carlisle N.Y. - Crewe H.S. 37608 0Z07 1407 Crewe Gresty Bridge (Drs) - Leicester L.I.P. 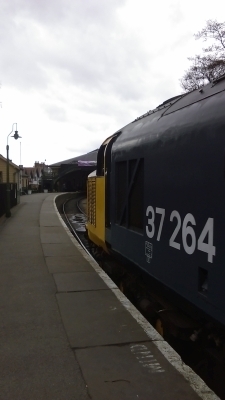 37609 0Z03 1245 Crewe Gresty Bridge (Drs) - Barrow Hill L.I.P. 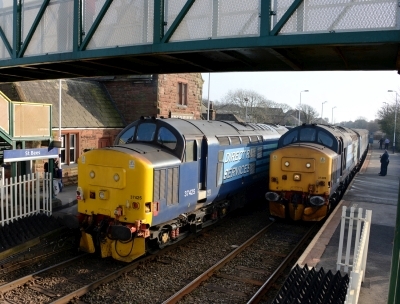 37612 0Z94 1645 Carlisle Kingmoor Sdg(Drs) - Carnforth D&U.G.L. 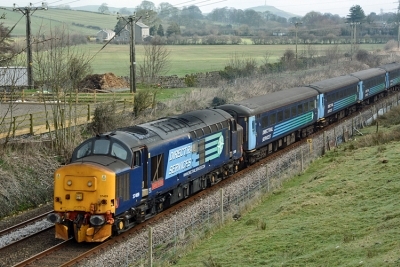 - Carlisle Kingmoor Sdg(Drs), collecting 37402 at Carnforth D&U.G.L. 37175 tnt 31233 3Z03 1014 Derby R.T.C. (Network Rail) - Hither Green P.A.D. 3Q20 2209 Hither Green P.A.D. - South Croydon - London Victoria - Preston Park - Hither Green P.A.D. 57305 + 37602 6C53 0630 Crewe Coal Sidings (Drs) - Sellafield B.N.F. 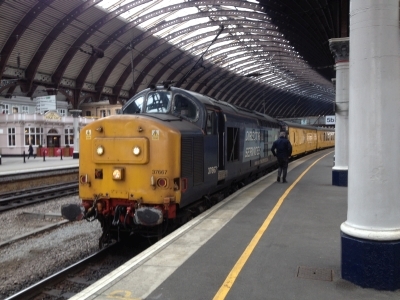 37059 + 37602 0C22 0656 Carlisle Kingmoor Sdg(Drs) - Sellafield B.N.F. 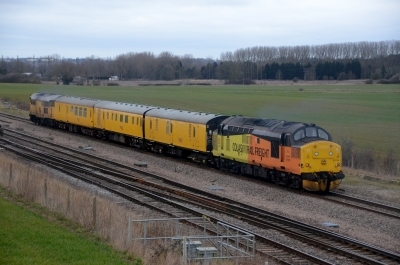 56113 + 37099 (37324) 0Z13 1030 Derby - Barrow Hill L.I.P. 68002 + 37609 6K27 1443 Carlisle N.Y. - Crewe Bas Hall S.S.M. 37219 3Q63 2324 Old Oak Common H.S.T.D. 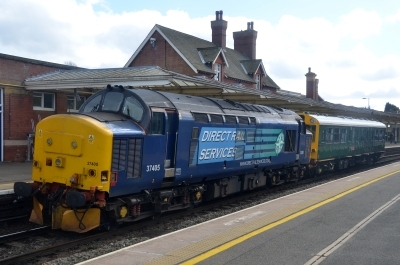 - Exeter Riverside N.Y.
2C40 0842 Carlisle - Barrow-in-Furness, failed at Sellafield, Overheating due to inoperative main engine fan. 37219 3Q39 1914 Derby R.T.C. (Network Rail) - West Ealing Loop - London Paddington - Didcot Parkway - Old Oak Common H.S.T.D. 37604 3Q15 1833 Derby R.T.C. 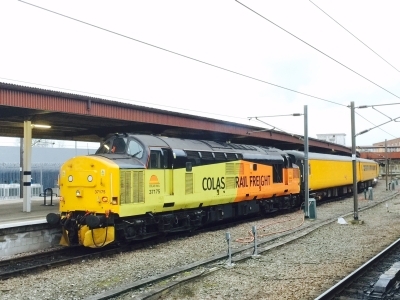 (Network Rail) - Wakefield Westgate - Doncaster - Heaton T&R.S.M.D. 37025 0C01 0738 Barry - Crewe Bas Hall S.S.M. 6Z90 1200 Crewe Bas Hall S.S.M. - Didcot T.C. 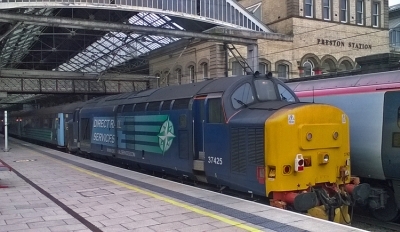 37254 & 56302 0Z54 1430 Derby R.T.C. (Network Rail) - Barrow Hill L.I.P. 37057 3Q40 2227 Hither Green P.A.D. - London Bridge - Gravesend - Battersea Loop - Hither Green P.A.D. 57312 + 37059 6C53 0630 Crewe Coal Sidings (Drs) - Sellafield B.N.F. 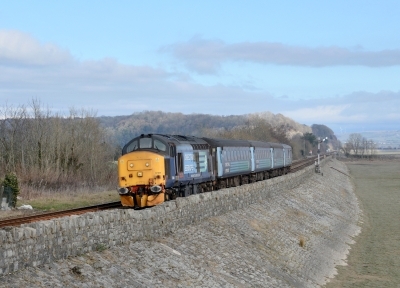 37218 tnt 37607 6C51 1258 Sellafield B.N.F. - Heysham Harbour P.S. 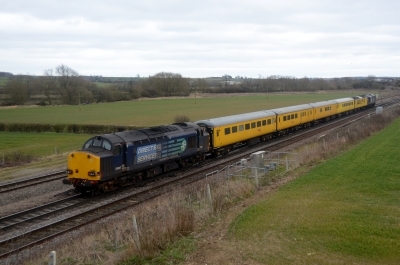 97301 3Z05 1210 Derby R.T.C. (Network Rail) - Lichfield Tv C E Sidings - West Ealing Loop - Old Oak Common H.S.T.D. 37884 0Z37 0717 Derby - Tyseley L.M.D. 5Z37 1043 Tyseley T.M.D. - Soho L.M.D. 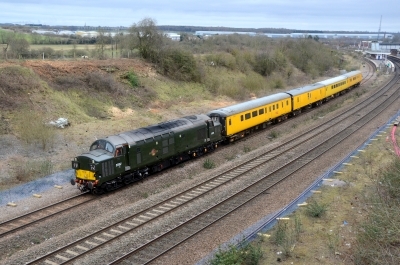 37057 3Z03 1014 Derby R.T.C. (Network Rail) - Hither Green P.A.D. 37175 tnt 37219 3Q69 2253 Old Oak Common H.S.T.D. - Acton Main Line - Rugby - Milton Keynes Central - Rugby C.S. 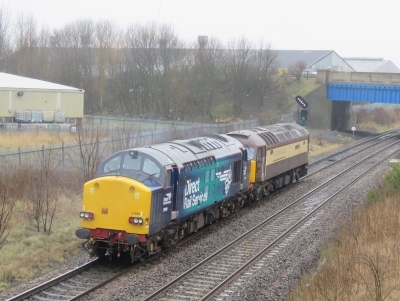 37603 0Z37 0845 Crewe Gresty Bridge (Drs) - Barrow Hill L.I.P. 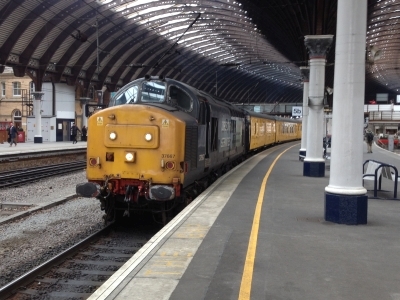 37059 + 37610 6C24 0536 Carlisle Kingmoor Sdg(Drs) - Sellafield B.N.F. 37419 + 37610 6C53 0630 Crewe Coal Sidings (Drs) - Sellafield B.N.F. 37884 & 86213 + 86701 + 86702 DIT 0L37 1310 Willesden T.M.D - Leicester L.I.P. 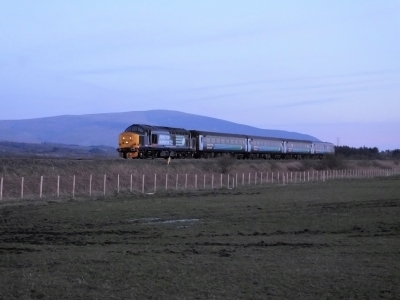 37069 + 66430 0C51 1258 Sellafield B.N.F. - Heysham Harbour P.S. 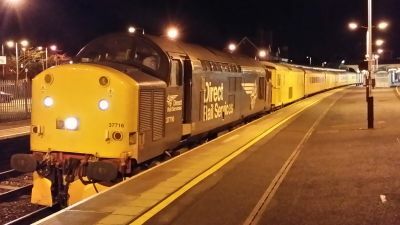 37069 tnt 66430 6C52 1605 Heysham Harbour P.S. - Sellafield B.N.F. 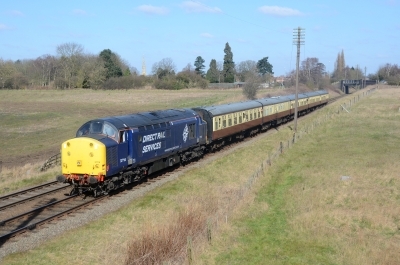 37175 3Q20 1352 Derby R.T.C. (Network Rail) - Heaton T&R.S.M.D. 37606 tnt 37608 1Q98 1400 Cambridge T.&R.S.M.D. - Norwich - Great Yarmouth - Norwich - Great Yarmouth - Norwich - Lowestoft - Claydon - Cambridge T.&R.S.M.D. 37606 tnt 37608 1Q97 0958 Ferme Park Recp. - Grays - London Liverpool Street - Harwich Town - Chelmsford D.G.L - Clacton-on-sea - London Liverpool Street - Shenfield - London Liverpool Street - Cambridge T.&R.S.M.D. 47773 + 37884 5T79 1358 Tyseley T.M.D. - Soho L.M.D. 37604 1Q65 20:42 Woking Up Yard Recp. - London Waterloo - Horsham - London Waterloo - Chessington South - Wimbledon - Shepperton - Wimbledon - Surbiton - Woking Up C.H.S.